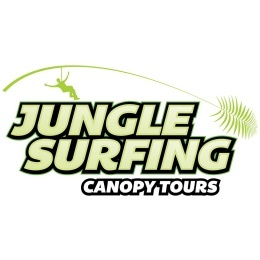 Jungle Surfing Canopy Tours - Tourism Town - The Tourism Marketplace - Find and book authentic experiences. 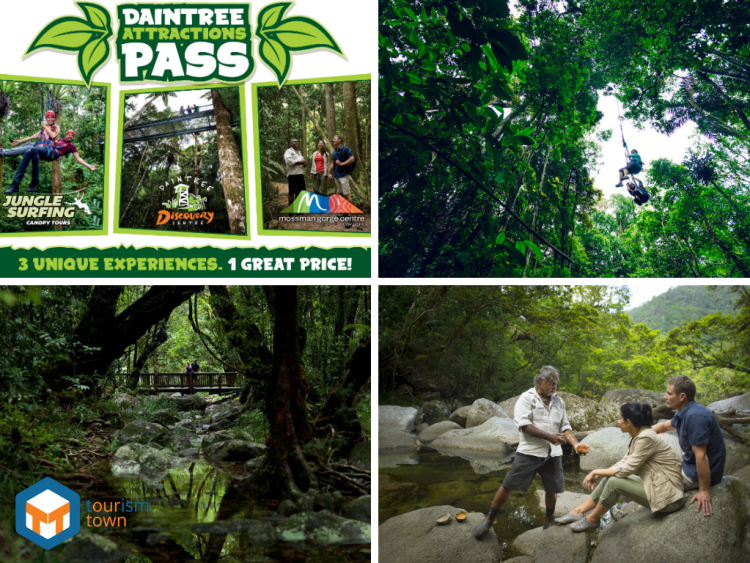 This exclusive pass gives you three great attractions for one fantastic discounted price, and is available for adults and children, including the memorable Mossman Gorge Dreamtime Walk, an exhilarating Jungle Surfing Canopy Tour and seven-day entry to the fascinating Daintree Discovery Centre. An amazing 1.5 hour cultural experience in the beautiful Mossman Gorge, part of the Wet Tropics World Heritage Area. It has five daily departures – 10am, 11am, 12pm, 1pm and 3pm – and includes the following. Our very own, award winning Jungle Surfing Canopy Tour, which takes approximately 2 hours, 1 of which is spent in the rainforest canopy on our Daintree zipline. We have multiple departures throughout the day – 7.50am, 8.30am, 9.10am, 9.50am, 10.30am, 11.10am, 12.30pm, 1.10pm, 1.50pm, 2.30pm and 3.50pm – and the tour includes the below. The Daintree Discovery Centre is another award-winning attraction. A world class interpretive facility providing guests with access to all levels of the rainforest, from the forest floor to the upper reaches of the canopy on a strongly constructed tower. You can explore the centre at your leisure between 8.30am – 5pm and it includes the following. You can choose to follow this itinerary, change the timings but still do it all in a day, or you can visit each of the attractions at any time during a seven day period. 6am – Depart Cairns for a leisurely drive to Cape Tribulation. OR 6:30am – Depart Palm Cove/Northern Beaches. OR 7am – Depart Port Douglas. 7:45am – Daintree River Ferry crossing. Top tip: Have at least $28 cash on you for the ferry in case of EFTPOS issues. Stop at Alexandra Lookout for spectacular views over the mouth of the Daintree River. 9:10am – Jungle Surfing Canopy Tour, Jungle Adventure Centre, Cape Tribulation Road, Cape Tribulation. Other departure times (subject to availability) are: 7.50am, 8.30am, 9.50am, 10.30am, 11.10am, 1.10pm, 1.50pm, 2.30pm, 3.10pm, 3.50pm and check in is 10 minutes prior to tour departure. 11:10am – Free time to explore Cape Tribulation’s beaches and boardwalks. Allow 30 minutes to drive from Cape Tribulation to Daintree Discovery Centre, and grab some lunch in Cape Trib, at Thornton Beach or at the Daintree Discovery Centre. 12:30 – Daintree Discovery Centre, Tulip Oak Road, Cow Bay. Explore the centre at your leisure with no set tour times and all activities self-guided, so you can choose to arrive and depart as you wish and to suit your personal itinerary. 2pm – Depart Daintree Discovery Centre for Mossman Gorge. 3pm – Mossman Gorge Dreamtime Walk, Mossman Gorge Road, Mossman. Other departure times (subject to availability) are: 10.00am, 11.00am, 12.00pm, 1.00pm and check in is 10 minutes prior to tour departure. 4:30pm – Enjoy more of Mossman Gorge or depart for your accommodation. From Cairns, take Sheridan Street (which becomes the Captain Cook Highway) north. Go past all of the Northern Beaches and Port Douglas, onwards to Mossman. As you exit Mossman, stick to the main road which is signposted to Cape Tribulation and Daintree National Park. Approximately 25km north of Mossman, follow the directional signage to the Daintree River Ferry. The ferry operates from 6am to midnight daily and costs $26 return per vehicle (EFTPOS available 9am – 5pm, otherwise CASH ONLY). When you drive off the ferry, follow the main Cape Tribulation Road north for approximately 45 minutes, until you enter Cape Tribulation. Jungle Adventure Centre is located on the right side of Cape Tribulation Road as you drive north, just after PK’s Jungle Village.